Originally built between 907 and 1125, Wangfujing Street was an unknown village then. After the Ming Dynasty (1368 - 1644), only 8 palaces of princes were situated in the street, which the name of the street originated from. With the ancient commercial civilization, Wangfujing Street is an integration of foreign Western culture and Chinese culture, equipped with countless China time-honored brands and many renowned brands of numerous multinational corporations. 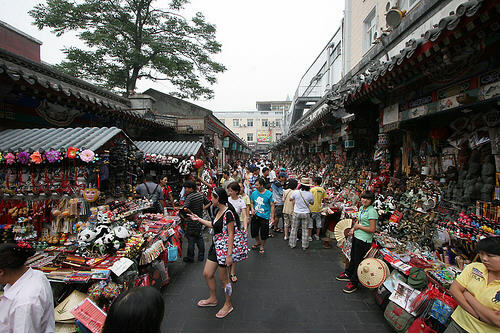 The street is home to the largest arts and crafts store, the largest Xinhua Bookstore, the largest foreign bookstores and the largest photo studio in China. In addition, visitors can also find many other types of boutiques. Wangfujing Street is also a paradise for foodies. There, you can enjoy the authentic Beijing Roast Duck, Wufangzhai - the largest company producing delicious Zongzi, Quansuzhai - ideal restaurant for vegetarians, Puwufang offering meat food and other prestigious shops. If you are planning to visit Wangfujing Street for photography purposes, the best time to visit is in the evening. You can visit the street at any time of the year. There are several buses passing by Wangfujing Street, therefore, there are several options. Take Bus 103, 104, 108, 111, 1, 20, 103, 104, 120, and Bus 140 to the Stop of Dengshi Xikou (灯市西口站) or the Stop of Wangfuing (王府井站). Take care of your values with you when walking around Wangfujing Street as there are plenty of visitors in the street every day. Some visitors who have tasted the food at the snacks street there don’t recommend the food as the food there is not tasty. They said the food looked beautiful but didn’t taste nice. Interested in visiting Wangfujing Street on a Tour? Wendy Wei Tours offers a variety of different packaged tours as well as custom tours including Wangfujing Street, among other attractions and destinations. To find out more, please visit our Tours page or Contact Us directly to find out more.